Tim Buckley was a singularly gifted singer and songwriter, but his body of work seems to defy the traditional logic of a single-disc career-spanning anthology. Buckley was a creatively restless artist, and he jumped from solo acoustic purity to folk-rock to psychedelia to jazz to R&B to purposefully scuzzy rock in the course of a recording career that lasted just eight years. The beauty and strength of his voice and his skills as a songwriter were the sole unifying threads in his discography, and many fans will even argue about those when it comes to his final three albums. 2001's Morning Glory: The Tim Buckley Anthology comes closest to capturing the artist's many facets, in part because it's a two-disc set that takes the time to examine his catalog with real scope, but Omnivore Recordings has taken a novel approach to summarizing Buckley's work with Wings: The Complete Singles 1966-1974. This collection features 21 songs that were released as single sides during Buckley's lifetime, including one unreleased track that was intended to be the B-side to a 1967 45 that never saw the light of day. The previously unheard number, "Lady, Give Me Your Key," is a gem, a lovely exercise in Baroque folk-rock that certainly justifies the release of this collection, as well as the inclusion of classic tunes like "Morning Glory," "Once I Was," "Aren't You the Girl," and "Pleasant Street." 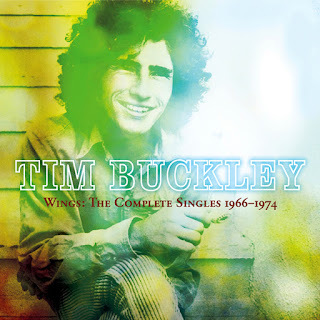 But Wings also confirms one bit of conventional wisdom about Tim Buckley: he thought in terms of albums, not singles, and as good as most of these tracks are, they sound a bit too ornate to have been pop radio favorites in their day. One senses the labels who released these tracks were grasping at straws choosing which might miraculously please a radio programmer. This set also passes on some of Buckley's best known songs because they were never released in 7" format (most notably, "Buzzin' Fly" and "Song of the Siren"), and three of his albums -- 1969's Happy Sad, 1970's Lorca, and 1970's Starsailor -- are completely unrepresented. However, while 1973's Sefronia is generally considered a botch, Buckley's cover of Fred Neil's "Dolphins" is here to show the album had a hidden gem, and the R&B raunch of "Move with Me" and "Wanda Lu" plays better here than in the context of the albums where they were first released. Wings doesn't do better than most Tim Buckley collections in making sense of his fascinating, sometimes contradictory songbook, but it does bring together an hour of good to brilliant songs from a one-of-a-kind artist, and the set includes an interview with Buckley's friend and writing partner Larry Beckett that lends some welcome insights into how these recordings came to be. Possibly one of the great vocalists of the 1960’s, Tim Buckley drew from folk, psychedelic rock, and progressive jazz to create a considerable body of adventurous work in his brief lifetime. His multi-octave range was capable of not just astonishing power, but great emotional expressiveness, swooping from sorrowful tenderness to anguished wailing. His restless quest for new territory worked against him commercially: By the time his fans had hooked into his latest album, he was onto something else entirely, both live and in the studio. In this sense he recalled artists such as Miles Davis and David Bowie, who were so eager to look forward and change that they confused and even angered listeners who wanted more stylistic consistency. However, his eclecticism has also ensured a durable fascination with his work that has engendered a growing posthumous cult for his music, often with listeners who were too young (or not around) to appreciate his music while he was active. Tim Buckley's musical growth was something to marvel at; with every album and with every song he wrote throughout his short, nine-year recording career, the American singer/songwriter became more daring, exploratory and confident. All ten of his singles (A-sides and B-sides included) have been collected — including a pair of unreleased songs from 1967 — on new compilation Wings: The Complete Singles Collection 1966-1974, along with liner notes featuring an interview with Buckley co-lyricist Larry Beckett and photos of every 45 included. Wings is released in chronological order and it's fascinating to hear Buckley's transformation from straight-ahead folk-rocker ("Wings," from his 1966 self-titled debut) to jazzy crooner obsessed with vocal experimentation ("Happy Time," from 1969's Blue Afternoon) to hard-edged boogie singer ("Move With Me," from 1972's Greetings From L.A.) and proto-classic rocker ("Wanda Lu," from his 1974 swansong Look at the Fool). While many of his B-sides, including the cocksure honky-tonker "Honey Man" and the unearthed British invasion-inspired "Lady Give Me Your Key" show Buckley sounding exceptionally loose and experimental, Wings is a highly listenable compilation that shows this true talent across all his many musical incarnations.